We are home once again from a trip that was mostly uneventful, but has left us tired and behind on our work at home. It was nice to spend time with family and celebrate all we have to be thankful for with the other people in our lives. I love watching the girls with our family. Traveling long distances is always hard with little ones, and we are very glad to be home. We have spent most of this Sunday trying to get caught up and seeing to the week ahead. 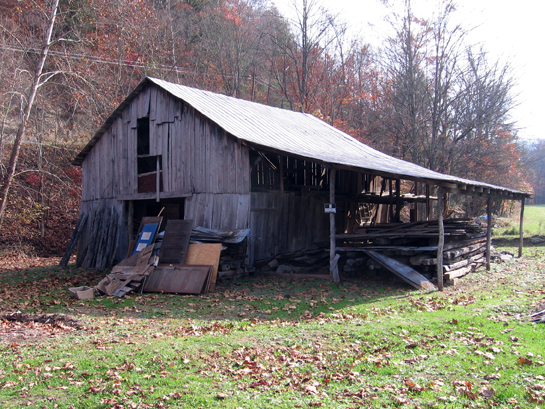 The first structure on the property when you emerge from the creek is an old barn that doesn’t belong to us, but we have recently been allowed to use it by our landlord. It is about two football fields distance from the cabin. When we came home last night, we couldn’t resist checking on the chickens that we moved there last week – if only to see how our work had held up in our absence. 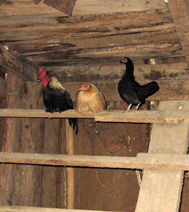 The two hens and one rooster that survived the move (We had one causality when our other rooster flew the coop and almost immediately was eaten by something hiding in the woods. We were moving them at night.) were roosting snuggled together and comfortable. 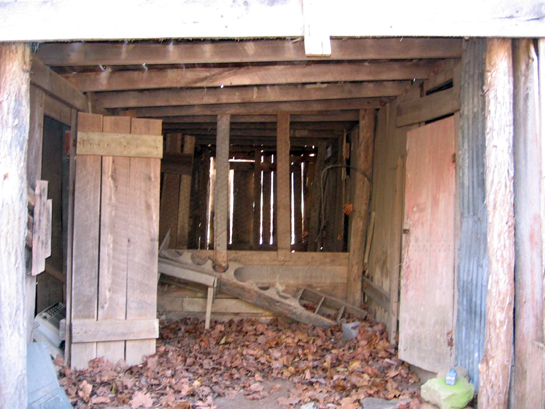 The barn where the side entrance to the chicken house now is. All we had to do was clean up a bit, build new nest boxes, and construct a chicken run that was as critter proof as possible with fencing and a gate. We began with what was left of the old. 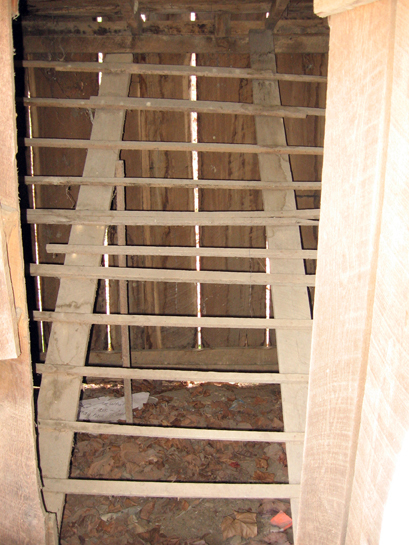 Old nesting area and boxes. The girls jumped right in raking leaves and moving light boards. John tore off the rusted chicken wire (poultry fencing), gathered posts for the fence, and removed the nest boxes. I started digging the trench to bury the fence under the ground. Before too long we were digging the post holes and nailing the chicken wire to our secured posts. I forgot to photograph the run and fencing because I am so enthralled with the inside that I didn’t even think of it. I’ll have to do that soon to share here. We all love outdoor work better than anything that can be done in the house. The exertion and experience of fresh air lends itself to a greater sense of accomplishment, I believe – at least for us. The warm few days that it took to get things completed were so exciting for the girls. Deladis could and still can hardly contain her joy and eagerness to get at them chickens. Ivy loves anything physical, so she was right at home. Now, if only the girls could get the chickens to let them touch them, then they would have it made. When we were finished we were all smiles. These pictures were taken this evening after checking in with our little flock. Like the fancy border on the nest boxes? Moving on up to the deluxe apartment in the sky! We still have another rooster and three hens that run loose around the cabin. I’m afraid they are going to be impossible to catch and move. They roost high in a planted Christmas tree that grows outside of our bedroom window, so high that they can’t even be reached with a ladder. They allow us only to get so close to them, which isn’t close enough to touch. 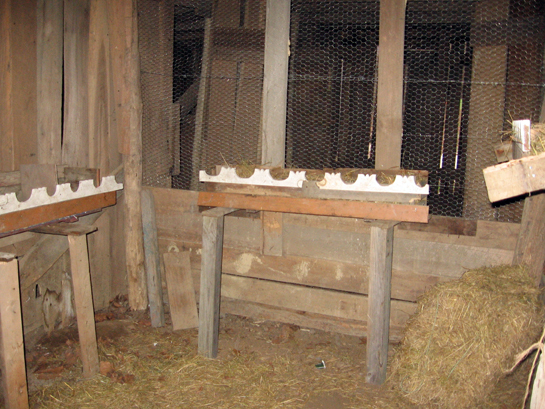 I can’t wait until Spring to go again to the stock sale for more chickens to add to our new chicken house, and a goat! There are three stalls on the other side of the barn and we’ve gotten the approval for a goat or two. 🙂 Oh, milk! It is really apparent to me that I need a break. Just a break. A mama break. Time to unwind. It’s 11:30 at night on the day before we make our big annual trip to Paducah, Kentucky to visit John’s Granny and Papaw, aunts, uncle, and cousins. I’m so excited that I have been asked to make some things to bring this year! Maybe this means I’m growing up. 😉 So, tonight, I’m baking. I’ve made sweet potato and raisin cookies and sourdough bread from the Nourishing Traditions Cookbook, and a coconut oil fudge recipe I got from a message board. At about midnight, I’ll put in the blueberry muffins. In the morning, I’m making a pumpkin pie. I’m looking forward to this trip. I love John’s family as much as I do my own. They are precious to me. The trip will also give me time to reflect on what is and isn’t working in my mothering. I have decided that I need an information purge. I first read about the concept on Alisha’s blog – On a Silent Sea, and her journey through reading The Artist’s Way by Julia Cameron. She posted the idea on August 19th. It has taken me this long to get the guts to try it. Since we are going to be away for the weekend, I think it is the perfect time to start. My biggest issue is the internet. I never used to use it like I do since we moved. I resented it really. I hated the thought of computers taking the place of books with pages, sticking your nose right in the binding and taking in the scent of paper and ink, flipping, marking, and highlighting your way through. I hated the internet for being trendy, the knew “thing”. Yet, here I am right in the middle of it. I don’t feel so strongly about it anymore, and I have come to see how useful it can be, especially to a mama who is kind of isolated in her beliefs and relationships. That mama being me. I live four and a half hours away from my best girlfriend and sister. There are no more weekends on her couch watching TV, eating, and talking about what goes and who gives. 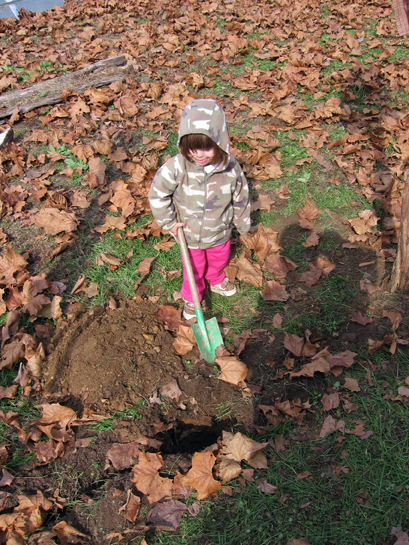 I am no longer close to the only Waldorf School in Kentucky, and therefore am missing out on that community. The attachment parenting group that I am a member of is also far away now, and there’s no more meetings at the coffee house, or VBAC support. I no longer have the community group meetings with my church sisters and brothers. These were weekly activities that got me out and into the world when we lived in the city. Granted, I’d be fine with just the weekends on the couch at Ariana’s, but I needed the rest too. Despite all the wonderfulness of home, I’m missing the break that these things gave me. A chance to get out of my shell once and awhile and experience people. I took the girls to most of these outings, but it was a time to be with others, vent frustrations to people face to face, a time to develop friendship, have meaningful conversations. Now, most days, the only conversations I have are either short evening ones with John, or on computer message boards. It has become such that if I have any little issue, my first instinct is to go get advice or look it up online. Sad, I know. Useful, yes, but sad. I’m so not good at making friends. If you notice, the above activities already put me at a place where there were folks meeting for a purpose, or common goal. I have such a hard time without that setting. There aren’t many opportunities for mothers here to get together, and when there are, I don’t see many taking advantage of it. John and I don’t get date nights. It is a rare thing that I am doing anything sans the girls. I simply don’t have childcare throughout the week when most things I would like to attend are going on. John is busy weekends, so those are out most of the time. I just don’t have anyone other than family (who work) that I am close enough to to feel unembarrassed to ask about childcare, and no money to pay anyone. Historically has it most of the time been this way for mothers, or were extended families and communities part of the child rearing? Self reliance conquers any difficulty. While I believe that relying on God is the first thing, I can completely understand what Yogi Bhajan meant here. The answers lie within ourselves. God in us. It’s there if we can shut out all the noise, observe, and listen. I don’t do that – not at all. That said, there will be no message boards, Facebook, or crazy internet searches for information for an unset amount of time. I’m going to use the extra time that will give me to work on my home, my selfishness, and my relationship with the girls. I’m going to use this time to listen, and come up with my own answers. I realize these last few posts have been lots of words and no photos. I will do better as soon as I am able. I also apologize for the typos in the last post that I haven’t had the chance to fix yet. I don’t know if letting others spend time in my head is interesting or not, but that’s what’s on my mind, and I’d like to tell someone. I’ve been guiding myself through my yoga practice the last six days with a set from the back of The 8 Human Talents by Gurmukh Kaur Khalsa. The music I have chosen, because I don’t have any yoga music, is Eddie Veddar’s work on the soundtrack to the movie Into the Wild. If you have never seen the movie, it is beautiful, breathtaking, and based on a true story. I love Pearl Jam and have since they became a band. I believe Eddie Veddar to be the best lyricist possibly who ever lived. There are two songs that seem to sing from a place where I am at now… Here they are for you. I hope you enjoy them. In her book The 8 Human Talents, Gurmukh Kaur Khalsa suggests taking each letter of the alphabet and acknowledging something that is a blessing in your life starting with that letter. I’ve been meaning to do that since I read that suggestion. We have so much to celebrate this week including John’s birthday and traveling to see family for Thanksgiving. I have lots of cooking to do too, happily. I think it is fitting to remember our blessings when things are busy. A – Ariana, my sister and very best friend since I was 8 years old. We finish each other’s sentences and can speak volumes to one another with a look. She is a huge blessing to me. Our relationship and the family we share is proof that God has bigger plans, even when it seems like our world is crashing in on us. B – Books. I don’t know who I would be without books. I can’t remember a time when books weren’t a part of my life. They are a great escape as much as a grounding force of information. I feel so bless to have access to most any book I would want to read without censorship from government. C – Cooking. I am so blessed to have found a love for cooking traditional foods and feeding my family as healthily as I possibly can. It is such a pleasure to put your all into a dish and watch your family enjoy it. It is like nothing else. D – Deladis. My first born baby girl who has changed my life forever. She has given me meaning beyond selfish goals. She is a light on her best days and a grounding force for me when things are hard. She is a gift from God. E – Expression. I have the freedom to express myself within and without my home. So many women around the world are kept silent. I feel like it is an amazing blessing that I can sit and converse openly with my husband without fear. I am so very thankful for freedom of speech as well. F – Food. I have enough to eat and feed my family and for the most part it is the best available to me. I am very blessed to have found a way of eating despite industrialization that is healthy. I no longer feel guilty or like food is my enemy. Yay! G – Grandparents. I am blessed to have met all but one of my great-grandparents. I am still blessed to have all my grandparents living. They have been such a huge influence in my life and upbringing. I would not be who I am today without their constant storytelling and nurturing. I still feel shocked when I hear of folks who haven’t had that, and I thank God for having them in my life. H – Hope. I have it and always will. In the face of adversity, I haven’t ever given up the hope of truth and the knowing that God knows what is best and will led me there. That is a blessing. I hurt for those without hope. I – Ivy, my second chance baby. Her spirit is so full of neverending energy and intention. Her birth taught me what it meant to be reconciled with reality in the midst of dreams and being okay with that. Her short little life has thus far showed me what one can do if they are sincere and never lose hope. J – John. He is my husband and greatest friend. I am so blessed to have found him when I was only fifteen years old. I didn’t have to spend my young days searching for love, but found myself grounded in the security of a well built relationship. That was something that I was so fearful of never having, and it is one of the first things God blessed me with in my adult life – a marriage. K – Kentucky. We have been ranked as the next to the worst place to live in the United States and the 41st in the nation for healthy folks. Hazard, just a short drive from our home, has been stated as the worst place to live in the country. However, I could see myself living no where else. I sometimes wonder about living in other states, but can’t bring myself to dwell on it long. I live in a place where folks will still pull off the side of the road to help a stranger. Where we pull our cars to the curb and stop out of respect for a passing funeral procession. A place where if you are hungry, you will be fed. A beautiful and mostly loving place. M – Mountains. I couldn’t have asked to have been born in a more beautiful, spiritual, and yet real place in all the earth (Not that I’ve traveled extensively. ;)) as the Appalachian hills. I believe it is some of God’s most magnificent handiwork, given to us to care for whole-heartedly and share with others. O – Originality and evolution of being. I’m glad there is only one of me, and I am so glad I can be ever changing. Motherhood has been the catalyst for more personal growth in my life than I have ever seen or even wanted before. God knew I needed children to heal. I didn’t, but He did. P – My parents and in-laws. I have found a place of peace in my relationship with both of my parents, and I am so thankful to be able to enjoy adulthood with them. I feel like I have three sets of parents too, my mother and step-father, my father and step-mother, and John’s mother and father. John’s parents have been so loving to me and having been a part of their life since I was still a kid, I feel like I belong to them too. They are all always there when we need them. I so love watching them be grandparents to my girls. Q – Quiet. I am blessed to be in this quiet holler after 7 years living on a busy city street, so out of my element, and nervous about sitting in my own back yard. Time in the city taught me a lot and I am thankful for that. I appreciate quiet like never before. R – Rest and the appreciation of it. I get an hour everyday with yoga to recharge my body through real rest – that is a blessing. S – Staying home with my children. I am so thankful to God for helping John provide for us so that I can be home with our children. We live a very small life, but it is a huge blessing to know that either John, myself, or close family and friends are going to be the ones impacting the lives of our girls. I am so thankful to have the choice of career/home/or both. T – Time. I so often complain about not having enough time in the day to do the things I want to do. I do get done the most important things though, including cooking from scratch, time in yoga and prayer, teaching and loving my children, time for good books and study, and time to enjoy my family. U – Union. I am thankful for my relationship with John and that it has lasted and is as strong as ever. I am at a place where I feel like we will spend our entire lives together. Having been a child of divorced parents and seeing the hurt it caused them and us, I was fearful. I am not fearful anymore. V – Violin (fiddle) and banjo music. The music of the mountains speaks to my soul like nothing else. X –X. If there is something that is wrong in my life, I can change it with God’s help. Mistakes can be a time for learning. Y – Yoga. I am firm in my belief that yoga is God’s gift to us. I am blessed to be able to practice 5 days a week. I have received so much healing from God through yoga. Z – Zeal. I have been blessed with it in whatever I find important at the moment. It is so helpful if I learn to acknowledge it and use it. I have a little quiet time. Both of the girls are napping, which is a bit unusual. I have a million things I need to be doing, but I’ve decided to update the blog in a more formal way. I don’t know when I will have the chance again. I was going to post about our work on the barn and moving our chickens there. I don’t know how much time I have and I haven’t uploaded the pictures yet, so I will post about life for me now. This is almost becoming a journal for me. If nothing else, it is a way to keep my family up from afar, and a way for me to keep a record of our life. After the last five weeks of things being so out of sorts around here, I feel like I’ve fallen into a land of chaos. There is so much to do and so much to be done. Catch my drift? 🙂 I think the ups and downs and the interruptions to our rhythm have fostered in a “stage” with the girls. They are both so very needy right now in different ways. It has caused me to pull back a little to problem solve. Sometimes it is so overwhelming being a mother – meeting everyone’s needs. I’m trying to observe where I am falling short in my keeping up a rhythm that satisfies all of us. That takes thinking about the girls and their needs throughout the day, adding in my goals for things to accomplish, and making sure John is fed and has clean clothes, along with a semi-tidy house. What about time to just be a family? This is a lot of reading. I am trying to read four books right now. Eli, the Good by Silas House, Heaven on Earth by Sharifa Oppenheimer, Concentration by Ernest Wood, and The Christian Home by the Valley View Mennonite Church. I do a daily Bible study. I am also attempting to enjoy the magazines and journals I subscribe to – Mothering Magazine, Yoga Journal, Appalachian Heritage, and Fugue. Reading the blogs I love as well as exploring the new ones, is another reading goal. Studying up on Kundalini Yoga, keeping up with yahoogroups, Facebook, and email… more reading. Did I mention I’m an information hound? I’m feeling like I need to pull back from myself. I’m healing and seeking and seeking some more. It’s not a wonder that I am having such difficulty making my mind be still. Again, I recall… “Cease striving and know that I am God…” Psalm 46:10. In trying to make things easier and more organized, I’m finding that I am slipping into a need for days to be 72 hours long. I’m becoming more and more tempted to shut it all off for awhile and trying to just listen. Yet, I need to study and prepare myself to teach my children, practice my yoga, and truly understand my spirituality and religious beliefs. What gives? Did I mention that I am still trying to write and submit? In all of this, I see the tremendous blessings in my life. I have the opportunity to learn about whatever I please, and devote as much time as is necessary and good to my family. That is a jewel more precious than any diamond. I’m waiting to listen to a free Waldorf homeschool workshop on teaching Waldorf Math. It starts at 8pm at The Waldorf Connection (http://attendthisevent.com/Modern/?eventid=9671790). We have been so busy this week and throughout the weekend. A dear family who we go to church with and the our children play together lost their mother to cancer. It has been a sad time for our little community, but her life was celebrated. It was most definitely an inspiring life. John is home for the entire week, including the weekend!!! We are working on moving our chickens to the barn about two football fields distance from the cabin. Getting caught up on the things that go kaput when we aren’t all together has been time consuming. The girls and I have had some trouble staying in our rhythm with all the staying away from home and extra errands over the last five weeks of John’s busy period. I’ve done the best I can, but I am realizing that our days need some tweaking. I’ve also decided to design our own curriculum for our homeschooling to better suit our needs. I’ll have to write more about that later too. It will still be Waldorf inspired. This lifestyle is working so well for us. I have also started a new Kundalini yoga set that turned my body to jello today. It was amazingly challenging, and I’m looking forward to the work it will bring about. I’m leading myself without a DVD to try to bring my focus more inward instead of planning incessantly as I tend to do for what is next. “Cease striving and know that I am God…” Psalm 46:10. I’m trying. So, I’m writing this on the fly. I’m not proofreading, but I wanted to say I’ve taken some pictures of our barn renovations and chicken prep, and will post about that really soon. I have plans to post about my schooling decisions too when I get them worked out, and what ever else comes along as soon as possible. Ms. Angie at The Artist, The Mom bestowed upon me my second blogging award ever! She is such an inspiration to me in real life and on her blog. I am flattered at the note she wrote about me and at being on her list. I went through the other bloggers she awarded, and am humbled to be included. The idea behind passing on this award is to list six things that others probably don’t know about me, and then to pass the award on to 5 other bloggers. Oh, my! I tell so much here that there isn’t much that I’d be willing to share on this little list that isn’t already known. I’m honest, so if asked, I answer questions honestly, and when writing about my life I am for the most part an open book. I think we are all in this life together to learn from one another. That’s the great thing about blogs too. I have things that I’d love to do/be, but fear I won’t get to do in this lifetime. (Some examples are: knitting on a regular basis and learning to use a sewing machine, owning a bookstore, owning a traditional foods cafe, being a doula or midwife, teaching yoga, and owning my own natural health/mama-baby store). My husband was only my third real boyfriend ever and my second serious one. We’ve been a couple since I was fifteen years old and we are best friends. I’m really shy and introverted unless approached by someone else to talk, then I can talk your leg off. I rarely initiate a conversation, and I’ve been known to hide because of being too nervous to talk. However, get me in front of a room of people to teach or speak on a topic and I’m good to go. I love public speaking. Though it can get lonely sometimes, I’m really comfortable being on my own… in my own little world. It’s something I think would be better if I could balance it out with some extroverted activities and IRL friends. The problem is finding those in the country for an at-home mama. I love heights. I love standing on cliffs. Going up in small airplanes is something I’ve thoroughly enjoyed since childhood. Rollercoasters are a blast. I’d bungee jump if given the right opportunity. I love a good thrilling ride, and the peace of being high up and looking out over earth. On a Silent Sea – I adore Alisha’s transparency. This blog is open about a journey so many of us are not brave enough to take. In fact, I’ve always been one to shy away from actively seeking some kind of self-improvement until we moved back to the mountains. I always thought life would do it for me. Alisha is an inspiration. Homemade Serenity – This is a newer blog that I have found and fallen in love with. It’s comfortable at Simple Mama’s place. Her pictures are breathtaking, and her approach to life seems so pure. Her words are a peaceful read. Life in Slow Motion – I love finding like-minded people in the blogging world. (I wish I were finding more IRL.) This blog helps me realize I’m not alone in my goals, struggles, and triumphs as a mama. It’s a wonderful read. Green V Neck – I am enthralled by Deb’s sense of humor about everything. Give her a topic and she can make you life. Not to mention she is a homeschooling mama and we have many of the same goals. Fun Mama – She deserves this award for even attempting to be a fun mama. I love her willingness to share her discoveries with others. In honor of Native American Heritage Month and our own Cherokee lineage, we took a family outing today to the Native Nations Mini Pow-Wow at a local community college. It was such a blessing to be there and to take the girls. November is filled with many important and beautiful holidays that I rarely hear mention of this being Native American Heritage Month as well. Everyone in the hollers and hills around us are preparing for Thanksgiving and Christmas. Today, there was well deserved honoring of our Veterans. Other Waldorf homeschooling families were celebrating Martinmas today, as they do in the Waldorf schools across the country. For some reason, I didn’t feel the calling to pick up Martinmas for our family this year. 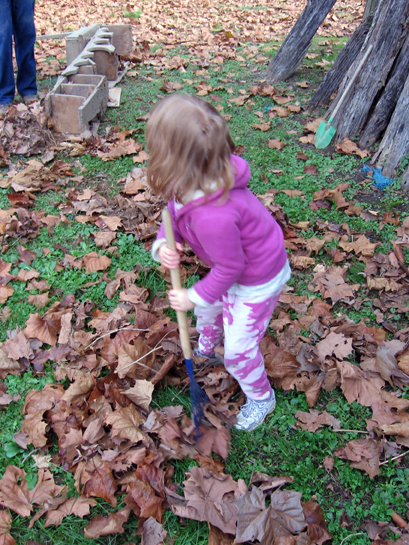 Though I do seek to follow the basic tenets of a Waldorf education for my children, I wanted something for us that was our own – something I didn’t have to research and contrive a meaning for myself in order to attempt to translate it for my children. So much of what was right about my childhood was the diligence of my grandmothers in teaching me from where and whom I came. When I had no self esteem at all, I still held great pride in my ancestry. 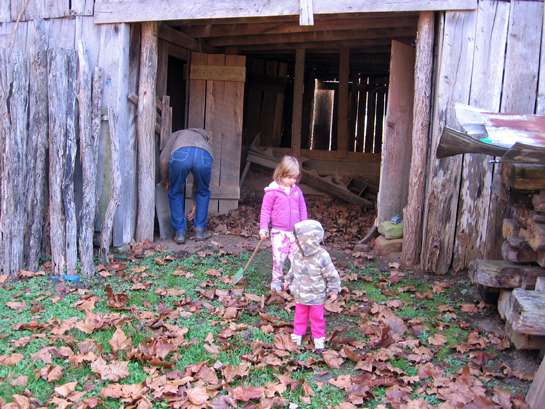 I want my girls to know exactly who we are and that there is a rich and distinct culture within our own family and within our own part of Appalachia. I firmly believe that this will prepare them to be confident and tolerant adults able to communicate with and love the people they meet. They will know themselves well enough that even when they are unsure of their path, they will know at the very least how they came to be. There were many tribes represented from all across the United States from the eastern woodlands tribes, the plains peoples, and even the Pacific Islanders. We saw hula dancers, tepees, various native dances and songs from the represented tribes. I participated in as much as I could. The best part for me was talking to a Mohawk Iroquois man. He explained to me how the Cherokee who resisted/escaped the removal (Trail of Tears) joined with the Iroquois for protection. He called it genocide, which is what I’ve always thought it was. He spoke of how their family/clan system was set up. He told me how the clan mother was revered even more than the chef, and in fact the chef answered to her. This made sense to them because no one exists without a mother to bring them forth to the earth. He explained to me the beaver bowl of rights and how Benjamin Franklin was key in bringing their ideas of place and government to the colonies. The man explained that Franklin got it all wrong though. He turned it into a Bill of Rights for the white Anglo-Saxon male. He left out women, men of other races, and importantly Mother Earth and the animals and plants that were created for us to co-exist with. All of those people and living things lost their rights. That is when things fell apart. When there was illness, and not enough food. Polluted waters, and fighting over land – real wars. This really made me think about the situations facing eastern Kentuckians with coal mining. (I’ll leave it at that for now. That topic would be a whole other post.) But, apparently we are the 49th happiest state with only West Virginians being sadder than we are. That really hurts my heart that things are so out of focus for many of my fellow mountaineers. I loved walking the girls around and showing them the artifacts, regalia, and pictures that were on display. They enjoyed seeing the wooden baby carrier (I forget what the woman called it. It wasn’t papoose.). Deladis got a kick out of the fact that we have one too, only not wooden. I found myself tearing up a little explaining to her that our people lived in log homes and stayed put a little more than the plains tribes. Our People. I wonder sometimes if I even have a right to say that. I look in the mirror and search for the characteristics that I saw in my great grandmother on my father’s side and the pictures of her mother. I believe that it is in my soul if not in my outward appearance, though I like to believe there is something of them in me. So, in remembering a piece of our history, I feel like we are moving forward as a family. Homeschooling for us is not about sticking to some set of rules, or adopting practices just because a curriculum says so. Waldorf for us is about acknowledging our relationship with the Mother Earth, with God, and paying attention to the natural blessings of changing seasons, weather, good harvests, and the animals. It is about learning our place in that world and existing harmoniously as much as we can with what is natural. What is natural to us right now, is grounding ourselves in our rich history, and using that foundation to move us toward the future with a postive light. I truly believe that it is John’s utmost dream to one day play in the band that is fronted by his two little girls. He is getting them started early, and they are loving every minute of it. They were born with the music of these hills in their souls. This is why we love the evenings when Daddy is home. This is the perfect after bath, before bed activity. I’ll let the pictures speak for themselves. Hear John’s music and the legacy that has been with our people for hundreds of years at www.myspace.com/haywoodbanjo or visit his YouTube channel (Renegade Hillbilly) under the links section in my sidebar. I rarely post a picture of myself on this blog (I think I have 3 times, this being the third), and you can see why. I am the real frumpy mom. I am the kind of person that the people doing these makeover shows would shake a finger at, then hug because they feel so sorry for me. If there is no where to go, I don’t get dressed. Yes, these are my pjs. A friend on Facebook posted as her status the other day that she wished she could have a job where she wore her pjs. I do – mother, writer, and homesteader. In this particular picture taken yesterday for this post, I am wearing a thermal shirt that happens to be the first present John’s mother ever bought for me. I have been with John for fifteen years, so there is no need for any math to figure out how old this shirt is. As for the pants, I have to apologize, I don’t sport cartoon characters usually. I had nothing else clean. Both of these garments are more than several sizes too big for me. My shoes are used. I am the third owner of them. First they were my sister’s, then my mother’s, and now they are mine. 🙂 The soles are falling off, but they still work good for sloshing around in our current muddy situation (Did you see the dozer?). My hair, I know you think is lovely. 😉 A twig bun in the back, with no brushing beforehand. Just up and twig. Oh, and no makeup. I rarely do makeup even when I’m getting dressed up. I don’t think John cares what I wear from day to day, and I am satisfied in my pjs. It’s not because I fancy myself ugly. I can dress for an occasion and that is exactly what I do. I love comfort and ease. I have too many other important things to worry about like preparing nutritious meals, homeschooling the girls, doing a yoga session, reading a good book, or writing this blog post.